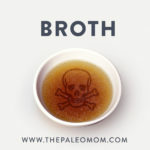 Home » Blog » Bone Broth Risks: Skim the Fat! 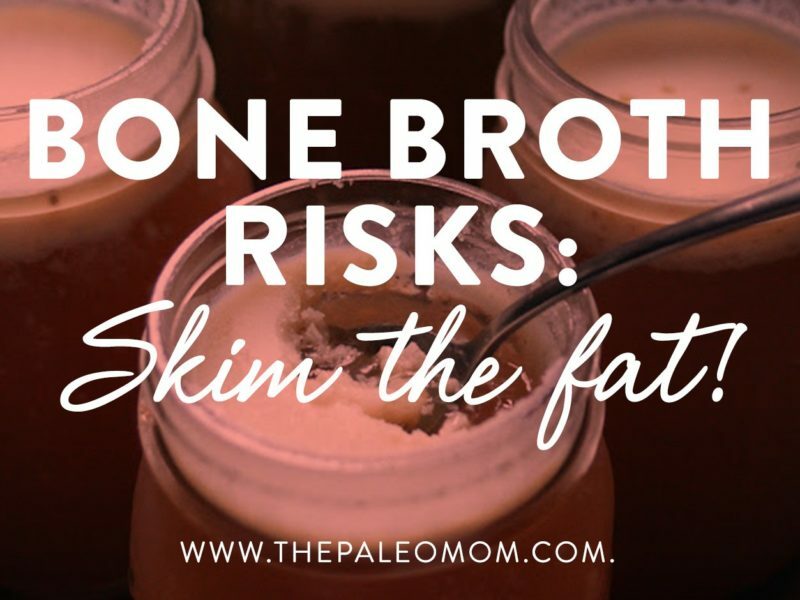 Bone Broth Risks: Skim the Fat! Between its abundance of gut-healing amino acids, its benefits for joints and skin, its awesome flavor, and its ability to warm us up on a cold winter day, there are plenty of reasons to eat bone broth (and to make our own! See Why Broth is Awesome and Chicken Bone Broth). But, what about the downsides? heavy metal contamination (see Broth: Hidden Dangers in a Healing Food?). 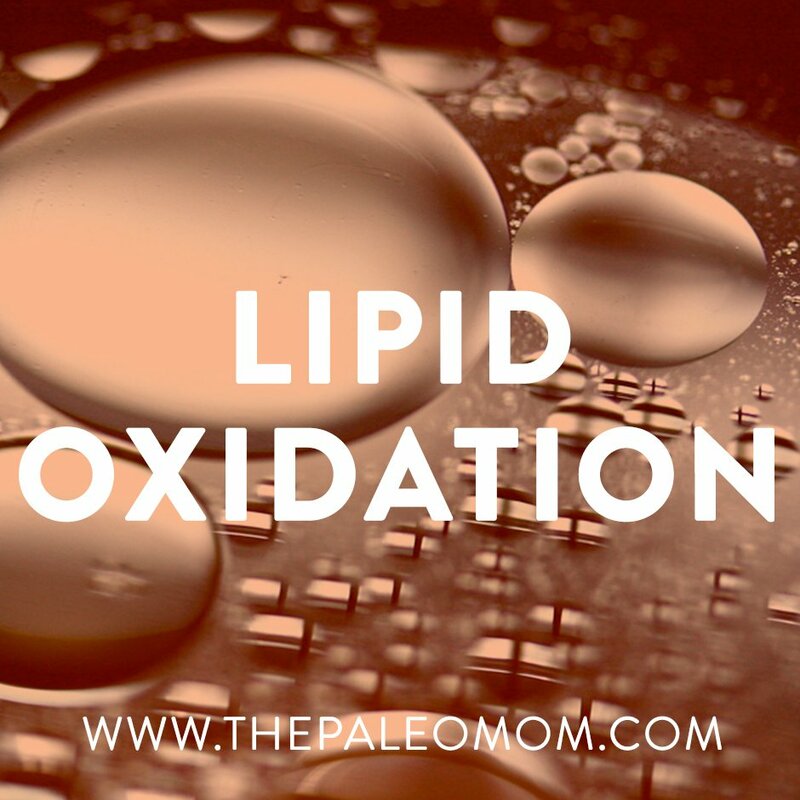 But there’s another possible concern when it comes to this nourishing food: oxidation. I first got thinking about this probability when my functional medicine doctor mentioned seeing a pattern of increasing LDL and triglycerides in clients consuming homemade broth on a regular basis. I think this may be attributable to, not to the broth itself, but that delicious layer of fat that rises to the top of our broth. It might be tempting to save for cooking (or even to slurp down with the broth itself), but could the prolonged exposure to heat and oxygen during the traditional 24-hour to 4-day simmering cause some of it to oxidize and become harmful? 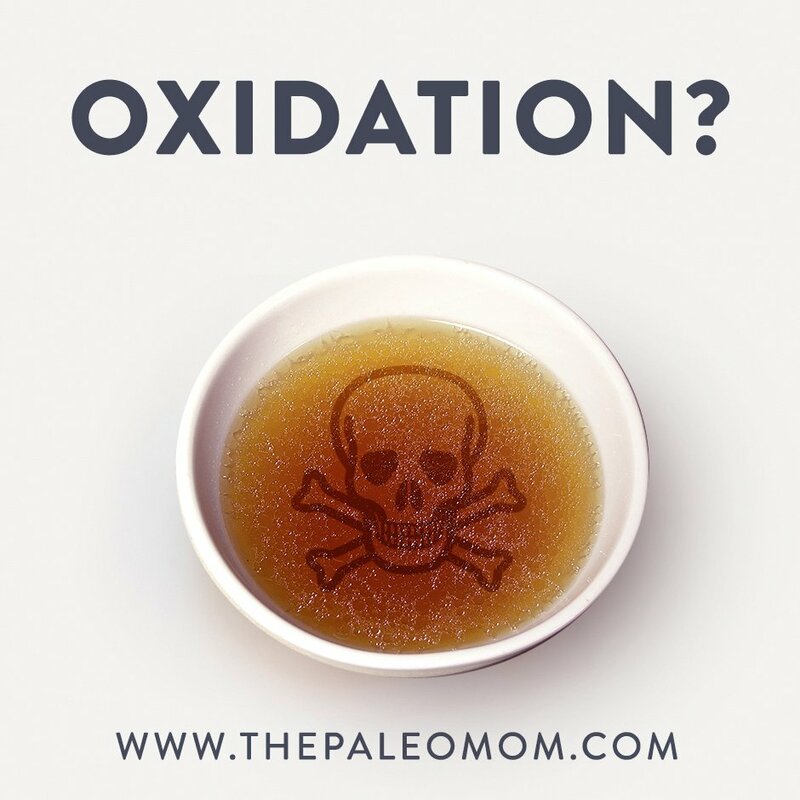 Unfortunately, there aren’t any studies measuring how much oxidation occurs in the fat rendered from bone broth. 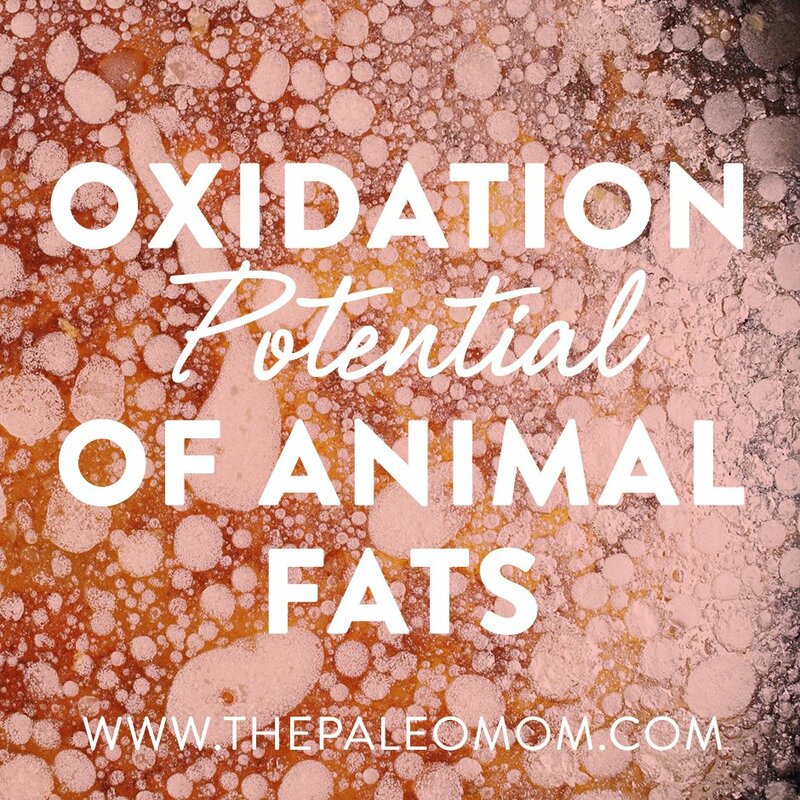 However, we can apply what we know about oxidative rancidity, the composition of different animal fats, and the broth-making process to get a sense of what’s most likely going on! Saturated, monounsaturated, and polyunsaturated fats are distinguished by the number of double bonds in their carbon chains (saturated fats have no double bonds, monounsaturated fats have one double bond, and polyunsaturated fats have multiple double bonds). Because these double bonds are essentially missing hydrogen atoms, they’re molecularly unstable, and can easily oxidize—undergoing a series of reactions leading to free radical production and rancidity in the presence of heat, light, and air. The oxidation rate for a fatty acid increases with the number of double bonds it has. So, while saturated fats are relatively stable, monounsaturated fats are slightly more oxidation-prone, and polyunsaturated fats can be extremely oxidation-prone given the right conditions (such as during cooking!). To make broth, we simmer bones at a temperature just below boiling (typically 94 degrees C, or 200 degrees F). Although this temperature won’t cause fats to oxidize as rapidly as high-temperature cooking methods like frying, damage still does occur—especially because broth spends such a long time simmering (the cooking process can last anywhere from several hours to 48 hours and beyond!). Studies show that highly unsaturated oils like corn oil, olive oil, and mixed seed oil (canola, sunflower, and safflower) begin showing signs of oxidation after only 40 minutes at 80 degrees C, with oxidation increasing during longer cooking times and higher temperatures. 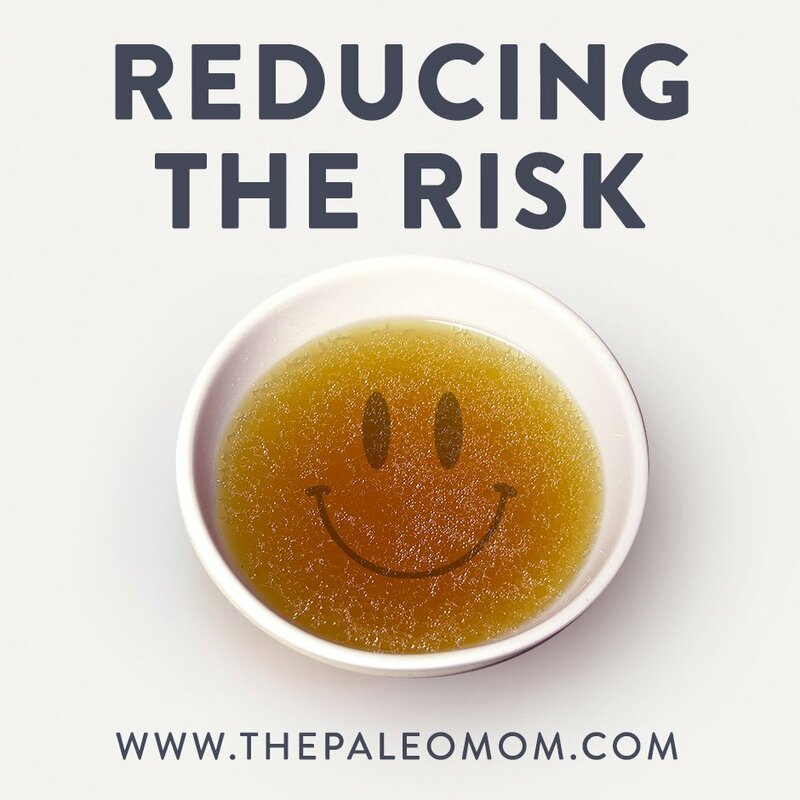 So, especially when using bones from animals with a higher polyunsaturated fat content (like chicken and other poultry), we would expect to see a similar process occur in long-cooked bone broth. This is particularly true because the fat rises to the top of the broth and can spend many hours, or even days, exposed to not only heat, but also air (hello, oxidation!). Prolonged cooking times for bone broth have become the norm in recent years because it maximized bone demineralization, thereby increasing the mineral content of the finished product. I personally, prefer to simmer my bone broth for 36 to 48 hours, until the bones can easily crumble in my hands (at that point, the bones are perfectly edible too, although they aren’t the tastiest of things). Fortunately, we don’t need to give up the benefits of a low-and-slow-cooked bone broth to minimize the risk from consuming oxidized fats. 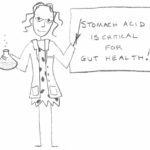 So, how do we reduce our exposure to potentially oxidized fat from bone broth without forgoing this wonderful food entirely? Use bones from animals with a higher saturated fat content (more heat-stable) and lower polyunsaturated fat content (think: beef and lamb bones rather than chicken, duck, or turkey bones). Avoid eating any broth fat that tastes “off” (rancid fat has a distinctly unpleasant taste!). Make broth using a pressure cooker in order to limit the fat’s exposure to oxygen. 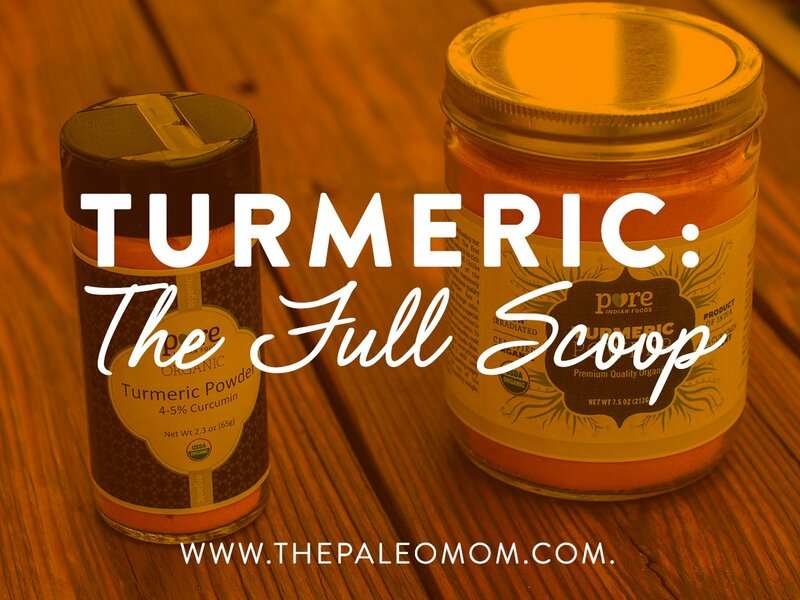 Go Instant Pot! Choose high-quality pre-made bone broths that already have the fat skimmed, like Kettle & Fire. With these tips in mind, we can reap the benefits of bone broth without ingesting harmful oxidized fats! Cortinas L, et al. “Influence of the dietary polyunsaturation level on chicken meat quality: lipid oxidation.” Poult Sci. 2005 Jan;84(1):48-55. Guillén-Sans R & Guzmán-Chozas M. “The thiobarbituric acid (TBA) reaction in foods: a review.” Crit Rev Food Sci Nutr. 1998 May;38(4):315-30. Gunstone, F. Fatty Acid and Lipid Chemistry. Blackie: London, 1996. Haywood RM, et al. “Detection of aldehydes and their conjugated hydroperoxydiene precursors in thermally-stressed culinary oils and fats: investigations using high resolution proton NMR spectroscopy.” Free Radic Res. 1995 May;22(5):441-82. Moya MC, et al. “Analytical evaluation of polyunsaturated fatty acids degradation during thermal oxidation of edible oils by Fourier transform infrared spectroscopy.” Talanta. 1999 Sep 13;50(2):269-75. Piette G, et al. “Influence of extraction temperature on amounts and quality of rendered chicken fat recovered from ground or homogenized skin.” Poult Sci. 2001 Apr;80(4):496-500. Prabhu HR. “Lipid peroxidation in culinary oils subjected to thermal stress.” Indian J Clin Biochem. 2000 Aug;15(1):1-5. doi: 10.1007/BF02873539. Zhang L, et al. “Effects of microwave rendering on the yield and characteristics of chicken fat from broiler abdominal fat tissue.” J Food Sci Technol. 2013 Dec; 50(6): 1151–1157. 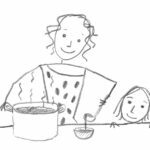 Broth: Hidden Dangers in a Healing Food? Have you ever tried wizzing the bone bits into a powder and adding it back to the broth? You could also add the powder to other recipes like mashed cauliflower. 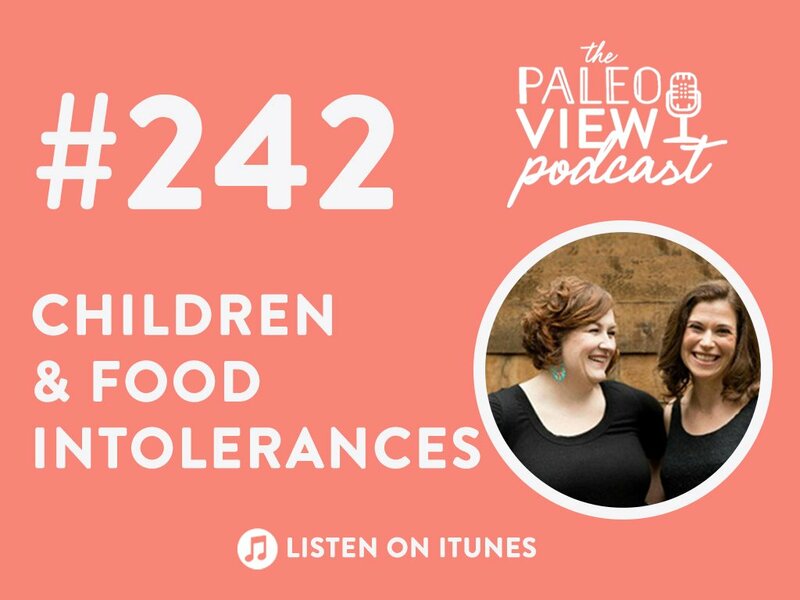 I was going to say bread and cookie recipes… And then I realized that I’ve been on the autoimmune Paleo and haven’t had any grain in over a year. I don’t even have grains in my house! But I still think of those recipes… LOL… Too funny! You mention pressure cooking the broth, which is what I do for 1-2 hours. Are you saying it’s okay to use the solidified fat (after straining and chilling) from this process? Or not? Thank you! I wonder if this could be what’s behind the bad headaches I often get, and occasional migraines – all on days when I’ve consumed broth? Histamine can be the culprit. I suffer from histamine intolerance and consuming bone broth always ends with a migraine… look it up. First of all, fantastic article! I really enjoyed it and I’m so happy I found it! 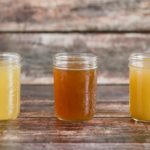 After reading about the benefits of bone broth, I was disappointed to find the myths that came along with it. It’s nice to know that by skimming the top I can remove some of the more harmful parts of the broth. I’m also going to begin to use beef bones instead of chicken. I thought all bone broth was equal but thank you for providing these wonderful insights. Next time someone in my family gets sick, I know what I’m making! 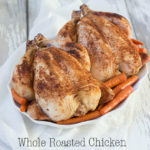 What about using a meat stock method where you only cook the meat and bones for 3 hours (as recommended on the GAPS diet)? You mention the extended simmering time as being part of the issue, so what about using the Instant Pot on manual mode for an hour instead of a long low slow cook? I wonder what results that would yield as far as mineral content and oxidation. I’m still learning about fats and am unsure if this would also apply to bacon grease. I save the grease after frying bacon to use to cook with such as frying up brussel sprouts. Is this something that will also potentially raise my cholesterol as I’m also feeding this to my husband and his cholesterol is already borderline. Foods with cholesterol do not raise the serum cholesterol in our bodies. Carbohydrates and sugars are responsible for this. Read ‘The Great Cholesterol Myth’ by Jonny Bowden. If I use high quality, grass fed and grass finished beef bones from a local farmer, and use an instant Pot for about 10 hours, do we have to skim the fat? This is the first i have heard of skimming the fat for any reason other than preference. We have been making it this way for a few years, and will definitely miss the fat if we need to toss it. Thanks for any help! 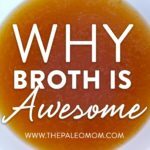 I have a question about bone broth. Vital Proteins has a new product called Bone Broth Collagen. It is a powder that you mix with liquids or add to food. Is this AIP? I was hoping for a convenient way to carry my broth on trips without being weighted down with cartons of it.